Genetically modified organisms (GMOs) refer to plants and animals with altered genetic makeups that have been edited in a laboratory to incorporate genes from other organisms. When scientists use genetic engineering to alter the genes of an organism, they're generally seeking to add a trait they view as beneficial, usually for production purposes. Genetic engineering is often done to achieve a trait not typically held by an organism, such as longer shelf life, disease resistance, or different colors or flavors. The dangers and benefits of GMOs are widely debated, but genetic modification is allowed in conventional farming in the U.S. As of 2018, any food item that is certified organic cannot contain genetically modified ingredients. Farmers long have sought to grow plants or breed animals with desirable characteristics. The earliest farmers chose seeds from their best plants as the sources for the next year's crop and selected their best animals to breed and produce another generation. Increased knowledge of plant and animal genetics led to the practice becoming more sophisticated, allowing farmers and scientists to select specifically for traits they wanted. 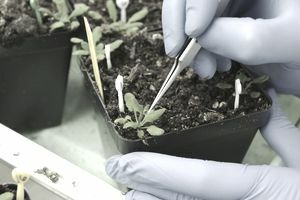 They also began creating new crop hybrids in laboratories and applying chemicals and radiation in an effort to induce desired changes in plants' genetic makeup. These efforts have led to a variety of new crops, including rice cultivars that are resistant to drought and wheat cultivars that have a much higher yield. GMOs take these efforts to yet another level and go beyond naturally occurring traits that can be achieved through selective breeding. Instead of inducing mutations that deliver desired characteristics, GMO scientists directly edit the genetic code of plants and animals by inserting genes that carry the characteristics being sought. The genes being introduced into one species can come from a completely unrelated species. A well-known example of a GMO food is Roundup Ready ​corn, a variety of corn created by Monsanto Company that's resistant to the herbicide glyphosate. This GMO-bred glyphosate resistance stems from the addition of a bacterium gene and enables farmers to use more of the herbicide, also manufactured by Monsanto, on their fields containing the corn. Other companies are developing genetically modified animals. For example, AquaBounty Technologies created AquAdvantage salmon, a genetically modified Atlantic salmon approved in 2015 by the U.S. Food and Drug Administration (FDA) for sale in the U.S. It incorporates genes from other fish, including the Chinook salmon, that enable it to grow twice as fast as nongenetically modified Atlantic salmon. Two common types of genetically engineered crops are insect-resistant (Bt) crops and herbicide-tolerant (HT) crops. Bt crops contain genes from Bacillus thuringiensis bacterium and produce insecticidal proteins. HT crops are tolerant to herbicides that farmers use to control weeds. According to the U.S. Department of Agriculture (USDA), the number of acres growing Bt crops and HT crops has more than quadrupled since the mid-1990s. HT soybeans, for example, accounted for only 17 percent of planted acres in the U.S. in 1997, but that number had risen to 94 percent by 2014. Other GMO crops experiencing a similar growth in popularity include Bt cotton, HT cotton, Bt corn, and HT corn. Identifying precisely how much food in the U.S. contains GMOs is difficult, but the FDA states that more than 90 percent of all soybeans and sugar beets planted in the U.S. are genetically engineered, and that number is close to 90 percent for corn. Those crops are the foundation for ingredients such as oils, sweeteners, and more that are used in many of the products sold on store shelves. Other GMO crops approved in the U.S., as of 2018, include cotton, canola, alfalfa, papaya, squash, apples, potatoes, and salmon. The World Health Organization (WHO) states that GMOs currently available are no more likely to cause health problems than traditional foods, but it also states that foods need to be assessed on a case-by-case basis. In the U.S., GMOs are regulated by the FDA, the USDA, and the Environmental Protection Agency (EPA). The main concerns of GMO critics are allergic reactions, the possibility of transferred genes in foods entering human cells and having a negative effect, and the possibility of outcrossing, which is when genes from GMOs find their way into conventional crops. According to WHO, no allergic effects have been found in GMOs on the market, and the possibility of gene transfers and outcrossing are low, though precautions are encouraged. Another controversy surrounding GMOs involves their impact on the environment. One Green Planet cites the impact of Bt crops on nontarget species as a potential problem. For example, bees are not considered to be a pest, but Bt crops still possibly cause harm to bee populations, which in turn could create a domino effect leading to pollination being inhibited. Butterflies and birds are examples also cited as nontarget species that could be impacted. Additionally, pests that are targeted are likely to eventually become resistant to the negative effects Bt crops might have on them, leading to an endless cycle of crops being altered further, followed again by further resistance from pests, and so on. The impact Bt and HT crops can have on organisms and microorganisms necessary for healthy soil also is a concern. Congress passed a law in 2016 to make it mandatory for GMO foods to be labeled as such, but the implementation of the law has been delayed. A public comment period was scheduled to continue through summer 2018 before establishing final standards for labeling. Among the topics being debated is the language to be used on the labels and what percentage of GMO ingredients a product must contain for a label to be mandatory.